Among the great firs and Ponderosa pines of Stanislaus National Forest in central California, Northern Goshawk nestlings crowd a platform nest of branches and pine needles halfway up a mature fir tree. In 2013, what’s known as the Rim Fire occurred, and some of the area burned with high intensity. Today, it’s rich with new growth and the bustle of Mountain Quails. Adult goshawks forage there. When the female goshawk arrives with a bird in her talons, the smallest goshawk feeds from the meat on her beak; the rest have learned the ways of their parents. Imagine yourself among the great firs and Ponderosa pines of Stanislaus National Forest in central California. 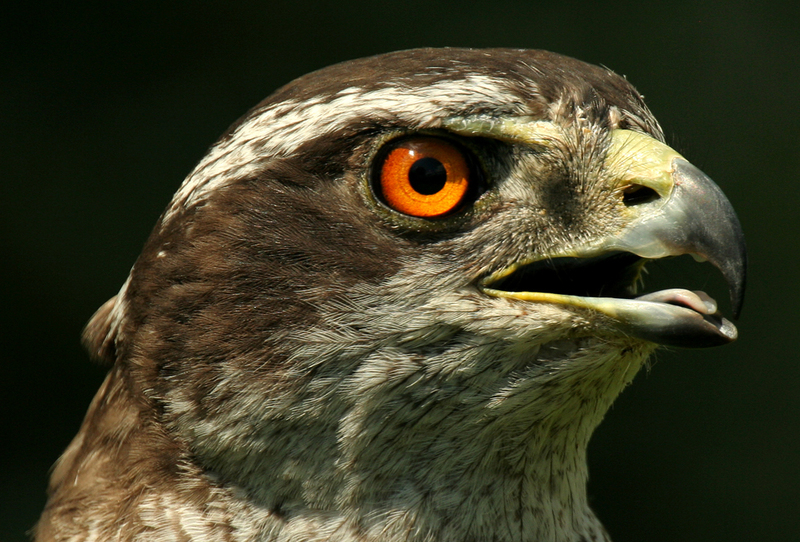 High-pitched calls of young Northern Goshawks pierce the morning air. As sunlight begins to spill through the trees, the whistling notes grow into clear, insistent calls for food. In early July, goshawk nestlings are crowding their nest, a platform of twigs, branches, and pine needles built into a crook halfway up a mature fir tree. This grove burned with low intensity: the understory was in flames. Most of the mature trees were charred at the base but remained alive. But less than a mile away is an area that burned with high intensity. It’s now rich with new growth and the bustle of Mountain Quails. Adult goshawks will have been actively foraging in those high-intensity burn areas. Now our nestlings’ squeals take on a tone of great excitement. 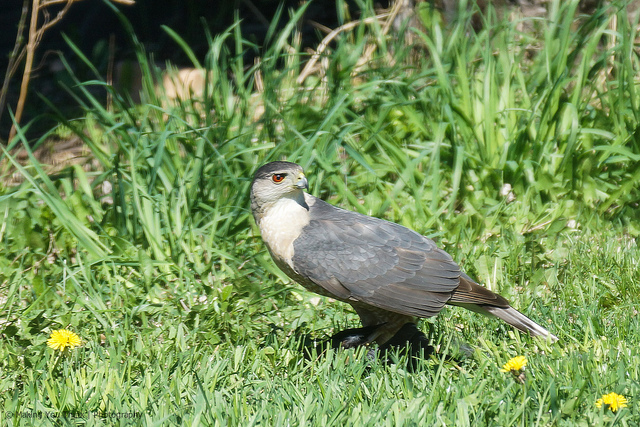 [Excited goshawk squeals] The female goshawk has arrived with a bird in her talons. Downy feathers fly, as parent and nestlings begin their meal. For BirdNote, I’m Mary McCann. Bird sounds provided by The Macaulay Library of Natural Sounds at the Cornell Lab of Ornithology, Ithaca, New York. 110168 recorded by Charles D. Duncan.